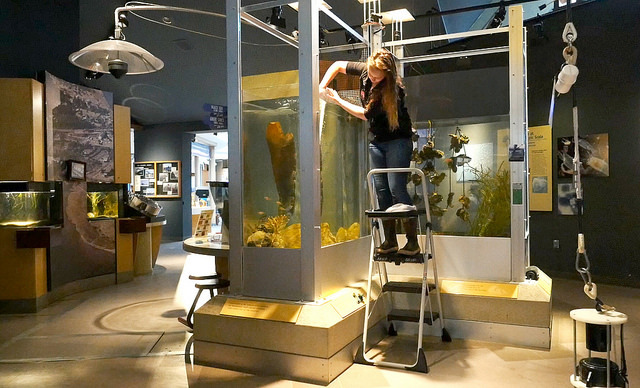 “Our goal is to really get students interested in science, technology, engineering and math — or STEM — and connect them with marine technicians and engineers and marine scientists that utilize remotely operated vehicles, or ROVs,” Tracy Crews, the manager of Oregon Sea Grant’s marine education program, said in the video. Two new videos from Oregon Sea Grant encourage boaters to help keep our waterways clean by emptying their portable toilets and holding tanks at designated facilities at marinas and short-term tie-up docks. 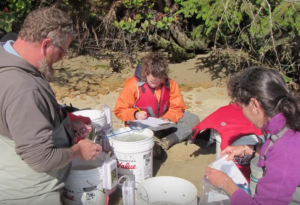 The videos, “Where to Empty Onboard Portable Toilets in Oregon” and “Where to Empty Onboard Holding Tanks in Oregon,” feature Jenny East, boater outreach coordinator with Oregon Sea Grant and the Oregon State University Extension Service. 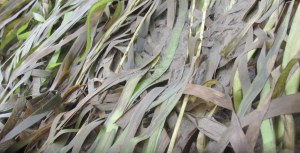 They are part of her ongoing efforts to educate recreational boaters about the availability of facilities at marinas for disposing of onboard sewage. Jenny East empties an onboard portable toilet. The new videos join a dozen others on the subject, available on a YouTube playlist here. Photos of East and some of the facilities she demonstrates in the videos are available for download from our “Boater Outreach” album on Flickr. 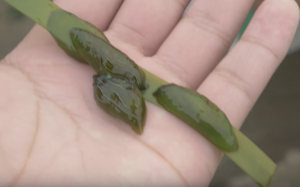 The videos were filmed and edited by Oregon Sea Grant videographer Vanessa Cholewczynski in collaboration with the Oregon State Marine Board. 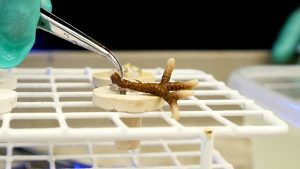 Have you ever wondered how aquarists care for the animals at the Hatfield Marine Science Center Visitor Center? 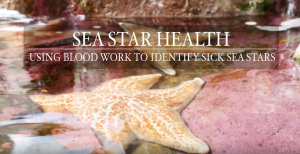 Now you can learn all about it, by watching this fascinating, award-winning video from Oregon Sea Grant: Animal Care at the Hatfield Marine Science Center’s Visitor Center. 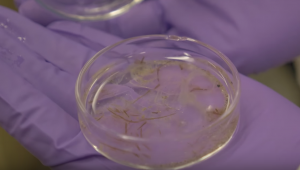 The full video (15:45) comprises six discrete segments, starting with a behind-the-scenes tour of the area where new and sick animals are quarantined and treated (0:52). 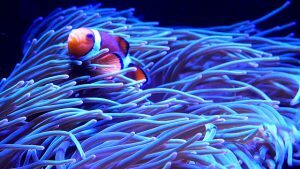 Other segments explain how aquarists feed the animals (3:54), take care of the octopus on display (7:10), care for coral (9:27), propagate coral (11:39) and clean the tanks (13:16). 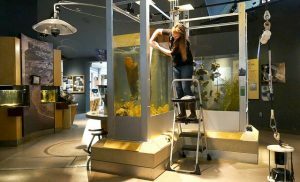 Oregon Sea Grant operates the Visitor Center, which features interactive exhibits and attracts more than 150,000 visitors each year. 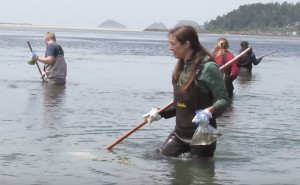 It is home to Oregon Sea Grant’s marine education program for K-12 students and teachers. 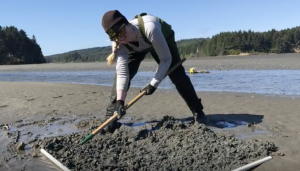 The video was filmed and edited by Oregon Sea Grant videographer Vanessa Cholewczynski. 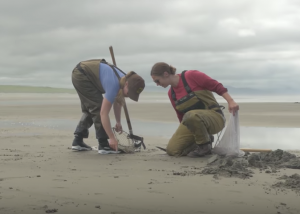 Oregon Sea Grant has won three awards in the 2017 Hermes Creative Awards competition. “Animal Care at the HMSC Visitor Center” won an Honorable Mention in the Educational Videos category; “Confluence” won Gold in Publications – Newsletters; and “The U.S. West Coast Shellfish Industry’s Perception of and Response to Ocean Acidification” won Platinum in Publications – Reports. 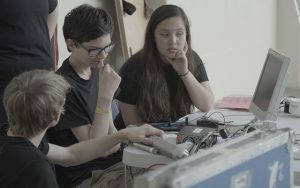 This year’s competition attracted about 6,000 entries from around the United States, Canada and numerous other countries, according to Hermes. 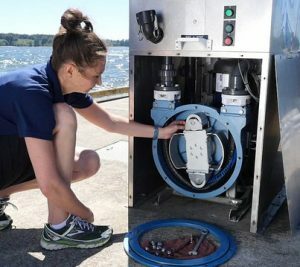 Oregon Sea Grant’s communications team has produced eight videos that teach maintenance staff at marinas and parks how to take care of sewage disposal facilities for recreational boaters. A need for training was identified after OSG Extension’s boating outreach coordinator, Jenny East, met with staff at various facilities, checked the equipment for wear and tear, and reported her findings to the Oregon State Marine Board (OSMB). Each of the eight videos focuses on a specific topic and can be viewed alone or as part of two longer compilations. The combined video about pumpout stations, for example, provides tips on how to perform weekly, quarterly and annual maintenance tasks; winterize them; and troubleshoot common problems. Another video addresses similar topics but for dump stations for portable toilets. OSG’s videographer, Vanessa Cholewczynski, shot and edited the videos; OSG managing editor, Rick Cooper, produced the music; and the OSMB provided input on scripts and the overall concept. Funding was provided by the U.S. Fish and Wildlife Service and the Clean Vessel Act grant program.